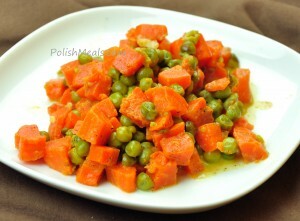 Peas and Carrots are one of the easiest to prepare and popular side dishes in Polish traditional cuisine. Not only healthy and nutritious but also colorful and tasty. Peas and Carrots can be eaten alone as a warm snack, they can be served as an appetizer with hard-boiled eggs or as a side with main course. Peas and Carrots are one of my favorite winter sides and are regular part of my diet. In a saucepan melt butter. Add peas and carrots and cover with 1/2 cup water. Bring to boil and cook for another 10 minutes or until vegetables are soft. In a separate bowl mix 1 Tbsp flour with water and stir until smooth and creamy. Add pinch of salt and pepper. Turn the heat to low and add thickening (flour+water) to cooked vegetables. Stir until bubbly. Simmer for 1 minute and serve. Posted in: Side Dishes. Tags: carrot pea butter flour.